Otomix now has their own line of Fight Gear! This foam sparring head guard is made of 7/8� foam dipped in vinyl. The dipped foam style makes it extremely durable. There is extra padding around the ears that protect your ear drums from injury. The extra thickness around forehead and the back and top of head protect against concussions and other head injuries. The design of the cutouts allow for air flow through the head guard. This allows heat to escape and cuts down on sweat. An elastic Velcro strap secures head guard at chin. This style is very popular with multiple sparring styles of martial arts. 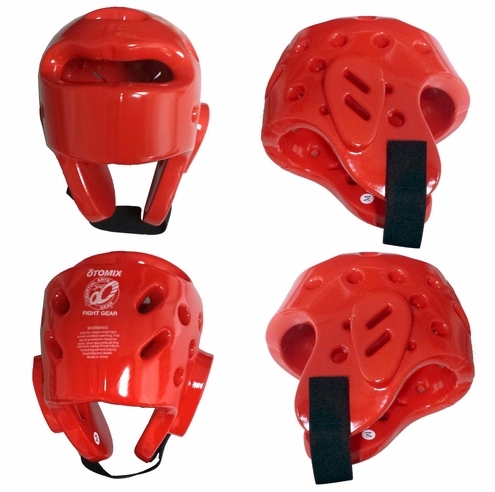 Karate, Taekwondo, MMA, and most other contact disciplines use this style of headgear. Along with a mouth guard a headgear is the most essential piece of protection. No logo on the front of headgear allows for schools to customize the gear. Head guard should fit tight but not uncomfortable. It should not be loose or move around. IF YOU DO NOT SEE YOUR SIZE, PLEAE CHECK OTOMIX AMAZON FOR AVAILABILITY.